The Pipe Clothing Rack brings a rustic yet urban style to an assortment of different stores, such as boutiques, thrift stores, and other retailers. 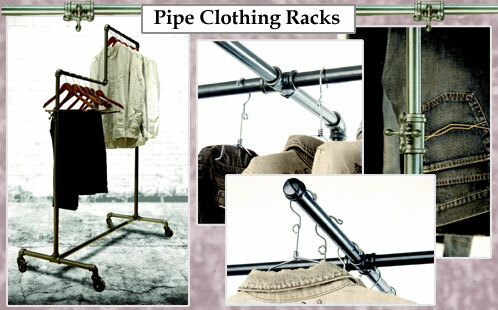 With the tough gray finish and sturdy casters, these Pipe Clothing Racks are ready to display the most stylish apparel. Adding to the authentic look of the Pipe Clothing Rack, the height adjustment on equipped models is controlled by faucet-style handles. Our collection of Pipe Clothing Racks includes Costumers, Single Rail Clothing Racks, Double Rail Racks, 2-Way Racks and more. Shop for your Pipe Clothing Rack today! If you can’t find the perfect Pipe Clothing Rack, chat online or call one of our knowledgeable sales staff, who will be happy to assist you. Do you have a vintage clothing shop and need to display your clothes in an attractive fashion? Try a Pipe Clothing Rack. This Pipe Clothing Rack is a great way to show off vintage apparel. Look no further than Palay Display's Pipe Clothing Racks. If you are organizing an entire department and don't know where to start, start with the Pipe Clothing Rack. Palay Display's Pipe Clothing Racks come with casters as an option, so the Racks are easy to move around. You will find it effortless to organize and rearrange displays. If you can't find the perfect Pipe Clothing Rack, chat online or call one of our knowledgeable sales staff. The steely gray finish on the Pipe Clothing Rack looks great with collections of both old and new apparel. Pipe Clothing Racks are versatile enough to be used at an assortment of stores, from boutiques to vintage stores to other retailers. If you can't find the perfect Pipe Clothing Rack, chat online or call one of our knowledgeable sales staff who can assist you. Do you have a whole department to organize? Try the Pipe Clothing Rack. It's easy to add other displays to your department, once you have the Pipe Clothing Rack. Organize other displays around it, such as Garment Racks, Shoe Displays, Round Racks, and more. Palay Display's Pipe Clothing Racks are adjustable in height and size, ensuring that you will find the right Pipe Clothing Rack to fit your store. The Pipe Clothing Rack also comes in single or double rails. If you have a large volume or a small volume of clothing to display, you will find the perfect Pipe Clothing Rack. The Pipe Clothing Rack conveniently comes with casters. The casters make the Pipe Clothing Rack mobile, easily moving from spot to spot in your store. It's simple to organize and re organize your department with the Pipe Clothing Rack. The Pipe Clothing Rack is a great way to display both your vintage apparel and your new clothing items. If you have to design or redesign your whole store, think of the Pipe Clothing Rack first. It fits in well with other displays and is mobile, making it easy for you to organize your apparel. If you can't find the right Pipe Clothing Rack, chat online or call one of our knowledgeable sales staff.